Checking your web site position is a very time consuming task. It may take you days to complete it by manually searching in the search engines. That's where Advanced Web Ranking comes to help. Advanced Web Ranking is able to query over 1000 search engines and quickly find out if you're moving up or down in the rankings, or if your site is listed at all. It will track the progress of your rankings over time and display that information in an easy to read and understand graphical and tabular reports. It can help you check not just the position of your website but the position of your competitors' web sites as well. 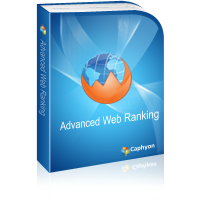 Advanced Web Ranking has the ability to generate and email reports after an update was finished. Couple that with the Scheduled Updates ability and you will be able to turn on your computer in the morning and find reports on your websites ranks waiting for you in your Inbox. As a SEO, you can have updates being run and sent to your customers every night without even lifting a hand. Various types of reports (Current Rank, Top Sites, Overview, etc.) can be created in any of the formats Advanced Web Ranking supports (PDF, HTML, Excel, XML or Text). Then they can be emailed to any of the addresses you pick from the Address Book, or saved to a folder where you can access them over the Internet.